One of the craziest expenses you will encounter while planning a wedding is the flowers. No doubt you already feel like you know that “flowers are expensive” but it is quite likely that you are underestimating the cost. Now you could skip them altogether and use something completely different if flowers are not your thing, but if romance and roses go hand-in-hand for you, you might need a little help figuring out how to consolidate them with a strict budget. Luckily roses lend themselves to all kinds of budgets. 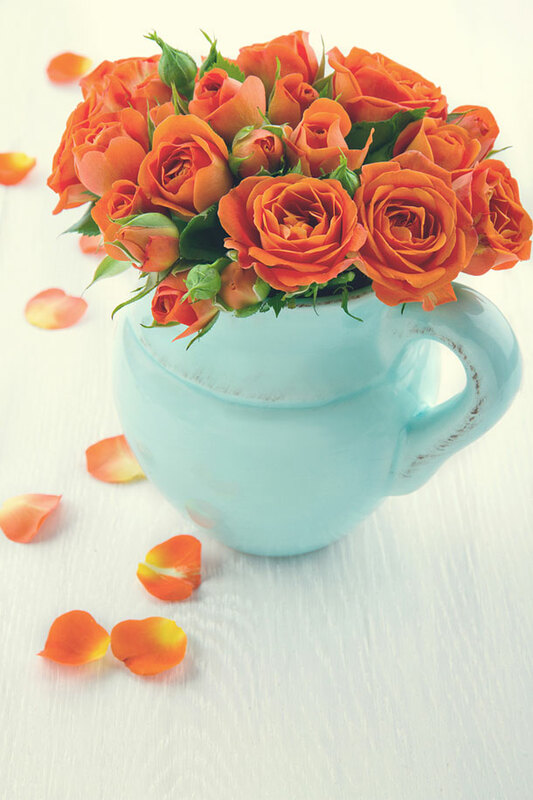 The secret to a great rustic rose bouquet is to keep it 100% simple – which means that all you need is roses! Order about eight dozen long-stemmed roses in the colour of your choice from you nearest flower wholesaler and be sure to ask them to have the thorns removed. On the day you can either cradle them in your arms loosely, or you can tie them together with a ribbon or some raffia of your choice. This is significantly cheaper than having a fancy bouquet made, and you might even find that it is much prettier! Instead of attaching little flower arrangements along every second chair down the aisle, why not line your aisle with potted roses instead? Pop into a wholesale garden centre and browse through their selection of potted roses. Choose small pots that won’t take up too much room. Cover the pots in hessian cloth and tie them off with a bit of raffia or twine. Use the same potted roses to decorate your tables. Either buy a few extra for the tables, or, if you wish to save even more money – use the same ones from the aisle. There is usually quite a bit of time between the ceremony and the reception, so organize for someone to gather up the aisle roses and place them on the tables. Have table number cards attached to sosati sticks ready to stick into the rose pots when they arrive. See? Quick and easy! Instead of giving out costly (and often insignificant) wedding favours, why not take a little time out of your evening to give each guest a long stemmed rose from your bouquet? As you work your way around the reception area, thanking each guest for coming, you can hand them a beautiful rose. Once the wedding is over and you are back from your honeymoon, the two of you can get you gardening gloves on and plant your roses. They will now serve as a constant reminder of your commitment to one another.